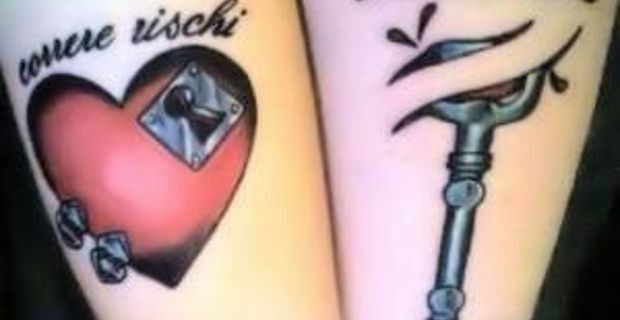 With tattoos becoming ever more popular, more and more people choose to seal their love story with indelible, distinctive, characteristic matching tattoos for couples. Matching tattoos for couples are coordinated in a way that each complete the other's meaning, or aesthetically being two halves of a single whole. They can connect and be in proximity to each other when the lovers hold hands, or embrace, or stand side by side. It is a marvellous universe, poetic and inspirational, revolving around the most romantic ideal of all, that of eternal love. Letters, names and writings, sentences, rhymes from your favourite love poem, lyrics from your favourite love song, there are endless possibilities for inspiration. Some couples, for instance, split the sentence in two halves, each getting one in a matching place, or choose the same names or letter, both getting them in the same place. Of course though, choosing to write on our skin the name of our beloved has its risks: there many people out there, celebrities and star included, who are currently undergoing removal or cover ups, in the unfortunate case of their love story ending badly. Symbols are much safer, and very common too. We are thinking of the ultimate love symbol, the heart, declined in all its possible variation: traditional, classic, comics style or futuristic, the heart for a matching tattoo for couples to split in two halves, or have identical. But also the key symbol, or the infinite one represent a great option for a small matching tattoo charged with meaning. Some couples also choose to tattoo identical rings on their wedding fingers, a love charm for a story that shall never end. Also consider coordinated dots that will perfectly cover each other when the two hold hands or embrace. Very romantic. Lastly, there is truly a world of possibilities for those tattoo lovers who choose to have a design specifically made, and specially made to be shared with the partner: tribal, classic, japanese or 3D tatoos, identical or coordinated, the choice is yours.